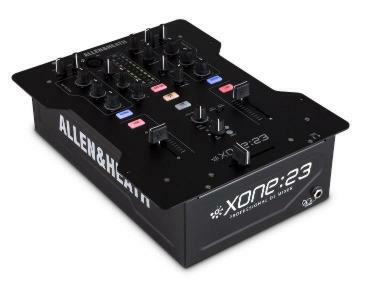 Allen & Heath launches the Xone:23, a 2-channel DJ mixer at Winter NAMM 2014, Anaheim, booth 6464 (American Music & Sound). The new mixer is packed with pro features that would normally be found in the booth of a top-rated club, including an enhanced version of the legendary Xone filter with resonance control, VCA faders, 3 band EQ, illuminated switches, crossfader curve selector, with styling inspired by the flagship Xone:DB4. At the heart of the mixer is the renowned analogue Voltage Control Filter (VCF) system offering low-pass and high-pass filters, frequency sweep and ‘mild to wild’ resonance control. There is also an FX loop to connect to third party effect units, which route back in through the filter system. The two stereo channels feature independent level controls for each input enabling up to four stereo sources to be simultaneously routed to the mix, as well as the dedicated send and return system for external FX. The mixer can also be upgraded with the latest (optional) Innofader for enhanced scratch performance. The main mix output and microphone input are on professional standard balanced XLRs, and there is a dedicated record output. The Xone:23 is equipped with comprehensive monitoring facilities, including a booth output with its own volume control, a cue mix control, and signal levels clearly displayed on the 9 segment peak hold meters. Styled on the Xone:DB4, the Xone:23 includes soft touch, backlit controls, light-piped meters and a distinctive new shaped steel faceplate.